Whether the prize is bragging rights to hold over your fishing buddies or the top place in a professional tournament, fishermen are always looking for that extra edge. That little something that puts you one step ahead may be a secluded fishing hole, a new lure color or a secret bait. Once you have the edge, how willing are you to share it? Long before Fred Roumbanis became a Bassmaster Elite Series touring pro, he was busy wreaking havoc on the legendary bass fisheries of the West. Roumbanis, who is from Northern California, was one of the first tournament anglers to understand and embrace the power of big bait fishing. Some call him “Swimbait Fred,” and he’s spent countless hours fishing swimbaits. He developed a knowledge base and level of proficiency that put him at the top of the sport. On a trip to Tennessee to compete in the FLW Everstart Championship, Roumbanis stopped into a local Bass Pro Shops store where he purchased a bunch of house-brand XPS swimbaits. To his good fortune, the lures turned out to be very productive. 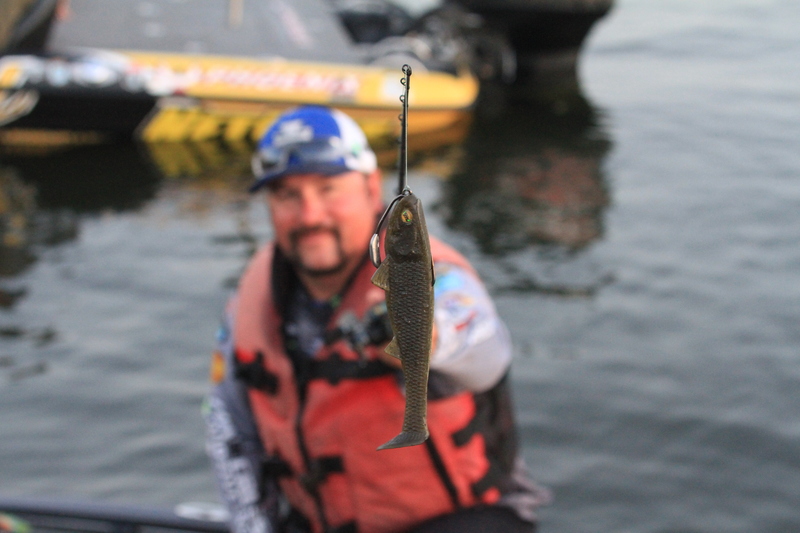 The following year, Roumbanis relied on the same swimbait at the inaugural Elite Series event on Lake Amistad in Texas. “It came down to the last minute; I lost a 9-pounder on it. I actually had to physically break it off because I didn’t have enough time to get in. It ran me into a tree and I ended up second there too,” adds Roumbanis. Despite the success of the XPS, it was not without its issues. “The problem with the bait is that it was not balanced and would not run right. The internal harness was off center most of the time, so I had to add nail weights to balance it. 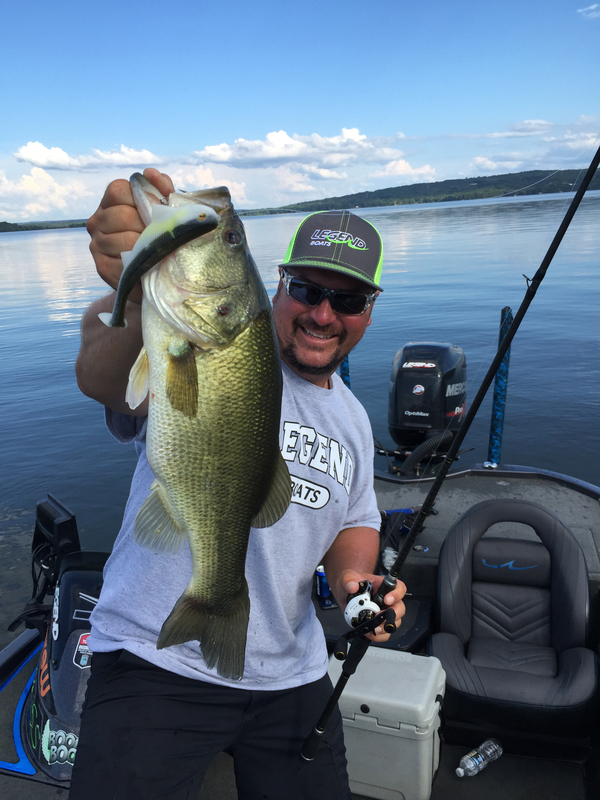 There were a lot of little tricks I had to do to make that swimbait work right,” Roumbanis says. With his limited supply of secret swimbaits almost exhausted, Roumbanis had been searching for the right opportunity to integrate all of the important fish-catching attributes of the best swimbaits, including the XPS, into a bait of his own design. That opportunity finally came to fruition in 2015, when his longtime sponsor, Optimum Baits, released their AA Bad Bubba Shad. Upon seeing its action, Roumbanis recognized that this new bait had the tail thump, body roll and, most importantly, the headshake he had seen somewhere before. This discovery would serve as the catalyst for what was to become Roumbanis’ signature bait, the Boom Boom Swimbait. Roumbanis worked diligently with the bait-design team at Optimum to perfect the bait. The Boom Boom incorporates the size, profile and, of course, the signature action he was after. Not only was it paramount for the new bait to have the correct action, Roumbanis knew that it had to have the right profile and the appropriate realism. 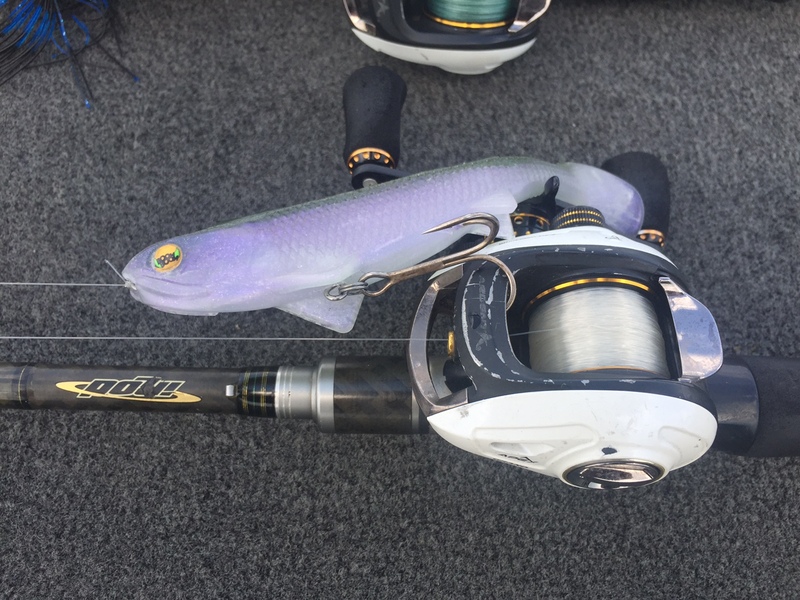 The designers at Optimum were also able to craft a weedless model to complement the standard rigged version while retaining the desired action. Roumbanis recommends rigging the weedless version with a heavy-duty screw-in hook such as the Owner 8/0 Beast Hook. After a comprehensive period of testing and development, the Boom Boom was released at the 2016 ICAST Show. The harness version is available in a dozen fish-catching colors and 14 for the weedless. Measuring 6 inches in length and weighing 2 ounces, the Boom Boom is an easy swimbait to fish, making it the ideal swimbait for tournament anglers looking for that kicker bite or for first-time swimbait casters as well. Unlike some swimbaits, the Boom Boom does not require specialized swimbait tackle and will not wear you out after a long day of casting and retrieving. “This is a bait you can have tied on year-round and catch bass from coast to coast in tournaments,” offers Roumbanis, whose bait fishes well on any number of heavy- to extra-heavy-action bass casting rods. 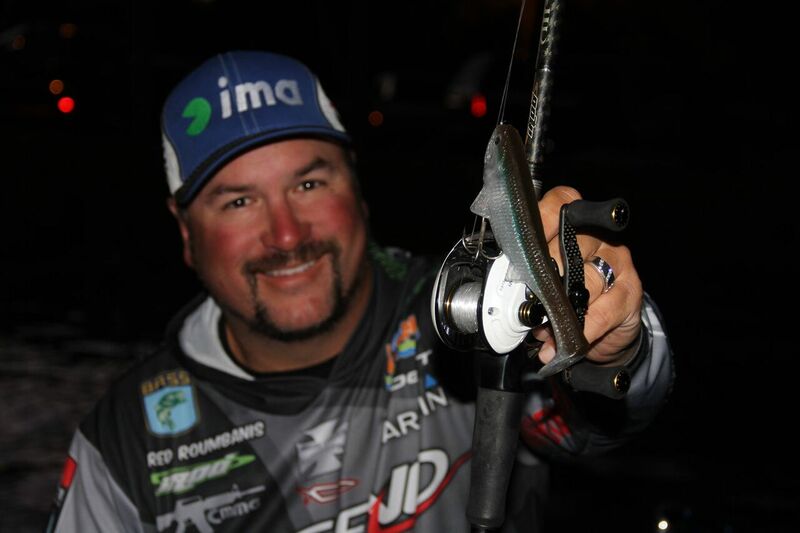 Roumbanis relies on his namesake IROD Fred’s Magic Stick, a 7-foot, 5-inch heavy-action parabolic casting rod that’s paired with a high-speed casting reel spooled with 10- to 20-pound fluorocarbon line. On clear-water fisheries such as Lake Shasta or Lake Oroville, Roumbanis recommends using 10- to 15-pound test, but suggests upsizing to 20-pound line on trophy largemouth fisheries. Even though it has been roughly a decade since he moved East, Roumbanis holds close to his Western roots, which is particularly true when it comes to swimbaiting. Don’t forget, California has always been the epicenter of the swimbait revolution. After all, the Golden State’s bass grow big when paired with planted trout and kokanee, making them very susceptible to a swimbait. The Boom Boom has extreme drawing power, but in clear water this attribute is magnified. For impoundments like Clear Lake or moving waters such as the California Delta, Roumbanis sees unlimited potential for the weedless Boom Boom. Editor’s note: For more on Fred Roumbanis, go to his website, boomboomfishing.com. More info on the Boom Boom Swimbait is available at optimumbaits.com.